Celebrating Christmas in the Caribbean is a unique experience that you will never forget. Jamaicans celebrate Christmas much like Americans: they go to church, exchange gifts with family and friends, then gather for a big meal. Christmas Day in Jamaica is a day of feasting on some unique delicacies you may never have heard of including oxtail, curry goat, and Gungo peas. Gungo peas are a Jamaican specialty that usually ripen in December, making them the perfect special ingredient for Christmas Day. Another holiday specialty loved by Jamaicans is a Christmas cake soaked in rum. Are you dreaming of a White Christmas, but on the beach? Sounds like an impossibility unless you happen to wake up Christmas morning in the Caymen Islands! The tradition of the Sand Yard starts in late October, when buckets of white sand are transported from the beach to Islanders’ front yards. December 24 is a special day for this tradition, when piles are raked into even blankets of white, and no one is allowed to step on them until Christmas morning. The Dominican republic Christmas season starts all the way back in October. October marks three months of parties, food, and fun traditions in the DR. Noche Buena is the biggest part of the holidays, thrown on Christmas Eve. The weeks leading up to Noche Buena are full of fireworks, or fuegos artificales. Another beloved tradition is known as Double Sueldo, when employees receive an extra months’ paycheck each December. French Caribbean islands give a nod to their British heritages when Christmas season rolls around. 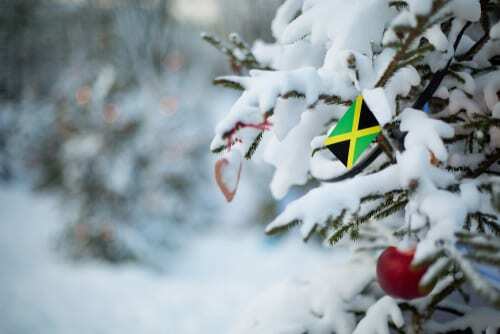 On Islands such as Barbados, a big part of the holidays is Boxing Day, which falls on December 26. On this day, islanders give special gifts to their friends and neighbors. Afterwards, the tradition usually ends with a picnic on the beach. On December 13, St. Lucians begin the Festival of Lights and Renewal, a celebration which honors St. Lucy, the patron saint of Light. The celebration begins with Christmas lights being switched on, plus a lantern-making competition each year. For the lantern-making comp, boys partake and fashion bamboo stalks to make homemade cannons. Using kerosene, sticks, and a bottle lamp, they compete with one another to see who can create the loudest explosion. Each morning starting on the morning nine days before Christmas, those living in St. Vincent and the Grenadines begin the annual Nine Mornings Festival. They wake up before the sun rises to fill the streets for a wild party. the party includes sea baths, costumed dances, and festive bike rides. The Carriacou Parange Festival is every year in Grenada over the weekend before Christmas. The festival includes free outdoor concerts showcasing some of the best parang bands from throughout Grenada. Parange bands play calypso-like music with drums, maracas, mandolins, guitars, tambourines and more. There is a huge daytime celebration, then the bands go door to door with carols to entertain neighbors late into the wee hours of the morning. Puerto Ricans celebrate Christmas much like we do in the States, with American carols, “Feliz Navidad” on repeat, and a huge traditional meal. Puerto Ricans serve local lechonera, or suckling pig slow-roasted over hardwood fires. In addition to this delicacy, families serve blood-sausage morcilla, or pig’s innards, and arroz con gandules, or rice and pigeon peas. Finally, wash it all down with coquito, a specialty Puerto Rican eggnog. Call us today to experience your own Christmas in the Caribbean at 402-281-3022. In addition, you can get started here.